Grease a 13x9-inch pan and set aside. Place the Vanilla Chex™ cereal in a large bowl and set aside. In a medium sauce pan over medium-low heat, melt the butter. Add the marshmallows and several drops of the food coloring. Stir constantly over medium-low heat until the marshmallow mixture is smooth. Add additional food coloring, if desired. 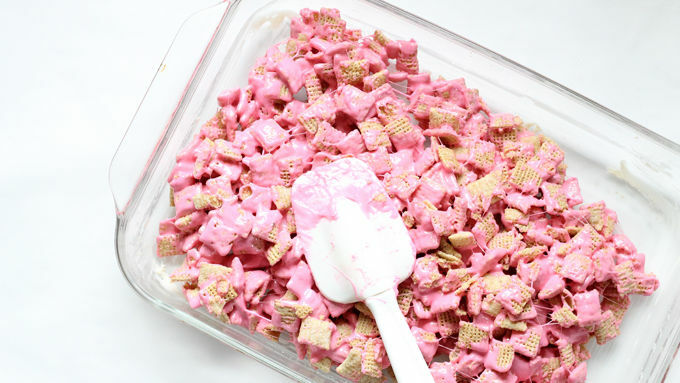 With a greased spatula, immediately pour the marshmallow mixture over the cereal. 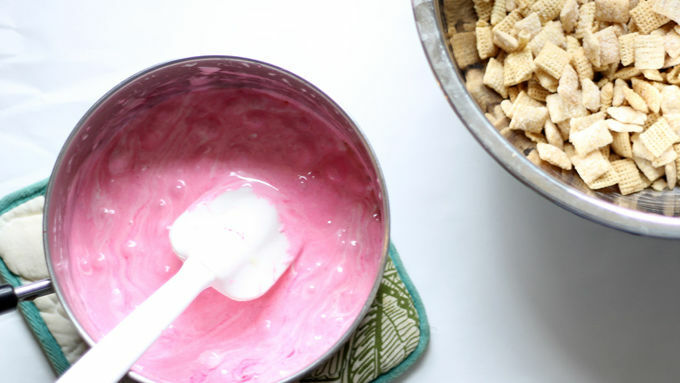 Gently fold the marshmallow mixture to coat the cereal. Pour the contents of the bowl into the prepared pan and lightly press the mixture until even. Let the treats set for 15 to 30 minutes. Use the heart cutter to cut out your shapes as close together as possible. Place the treats on a baking tray lined with wax paper. If desired, press a few conversation hearts onto the top of each heart. Let the treats set for 1 more hour. Instead of food coloring, you can use an envelope of powdered fruit drink with the butter and marshmallows to create your desired color. Microwave instructions: Instead of cooking on the stovetop, place the butter and marshmallows in a microwave-safe bowl and microwave for 90 seconds, or until the marshmallows puff up. Microwave up to a minute more if needed. Stir in the food coloring and stir well until smooth, and add to the cereal. Follow the rest of the instructions above. 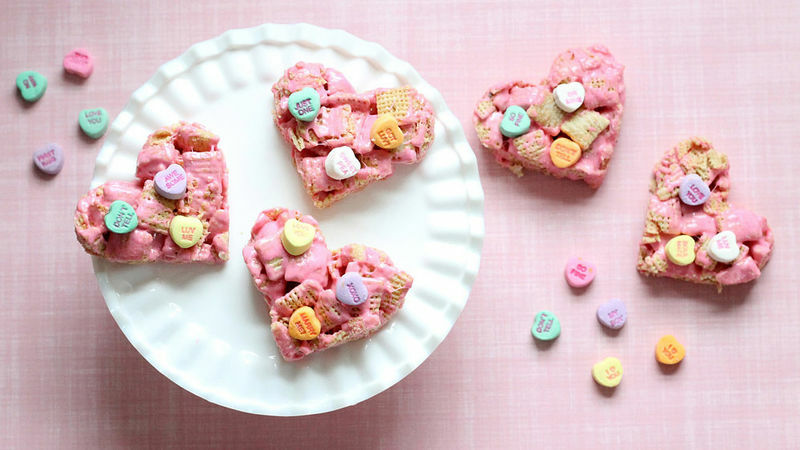 Valentine's treats don't get any easier than this! Oh, for the love of Valentine’s Day! Vanilla Chex is so good. I snacked on it so much, I almost didn’t have enough for these treats. Thank goodness I restrained myself and made this batch of awesomeness. 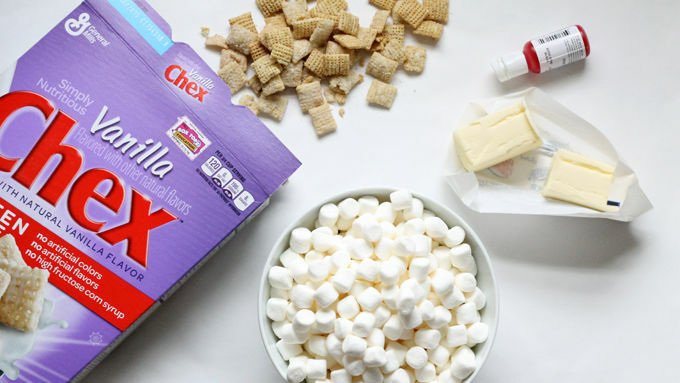 This cereal is ideal for making treats, because the Chex™ stays crispy, even when covered in melted marshmallow. 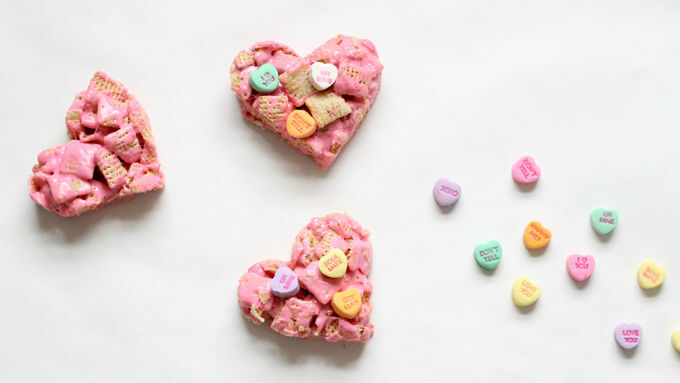 And these cereal treats are heart-shaped and decked out in pink just for the season, so you kind of can’t go wrong here. 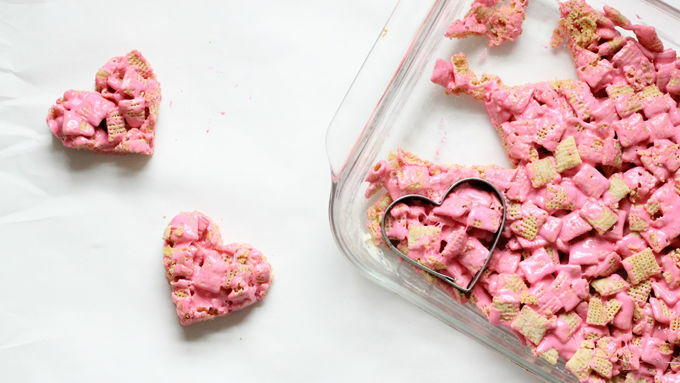 You can even add a little message if you like via that tell-all candy: conversation hearts. Share with friends, family and the ones you adore – and enjoy!